From the opening drawl of, “M..I..C..K..E..Y..M..O..You gotta put your hat on boy. Alright, you wanna be in the band, better put your hat on…” I knew I’d found it, that new ‘something’ I’d been looking for – bluegrass music. It was at once everything I liked about music; raw, basic, live and lively. It was rock ‘n’ roll fused with country, fused with blues and folk. It certainly wasn’t new but it was new enough to me. 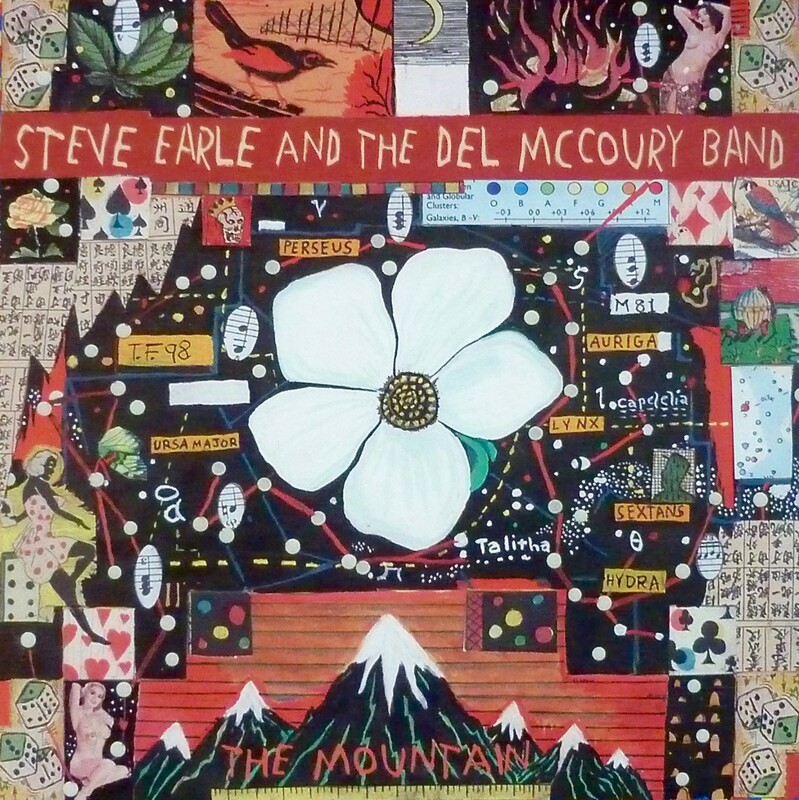 I’d never particularly been a fan of his, but I’d heard Steve Earle being interviewed on the radio as I was on the way home from the gym one Saturday afternoon and had been massively impressed with his attitude. He told how his record company hadn’t wanted him to release a bluegrass album but he’d done it anyway, because he ‘believed in it’. He recounted how the musicians had all basically sat in a room, around one microphone and just played. And how they played! The musicianship was brilliant but never at the expense of the songs. They were lean and tight with great melodies and heartfelt words. The song they played on the radio was title track ‘The Mountain’; the line, “there’s a chill in the air only miners can feel, and there’s ghosts in the tunnels that the company sealed” sending shivers down my spine. I bought the album as soon as possible and played it to death, telling everyone and anyone who would listen. I learnt four songs within a week and stored them in my mental jukebox for use at some later date. Years before this, my dad had bought and played me a cassette by a bloke called Buckwheat Zydeco, raving about the bum-ching beat that he loved do much. Zydeco music is very very similar to bluegrass. It did strike me that at very nearly forty years of age, I was turning into my dad! And it was my fortieth birthday in August. It wasn’t as if it could slide by unnoticed either as the day of my birthday was the very day Britain “all went strangely dark”. It was a total eclipse of the sun, a rare occurrence in this country but which, along with James being born at the exact time the rare nacreous clouds appeared over Sheffield, made me think we were somehow linked to the skies. Everyone on the news was warning us not to look directly at the sun but, sod that, I thought. I looked. I didn’t go blind. Out on the patio, it did go unnaturally cold as the darkness grew and whilst up in the north of England it wasn’t a totally total eclipse, it was pretty spectacular. For my ‘significant birthday’ present, Wendy paid for me to spend a week photographing the ancient stones in the Kilmartin area of Scotland. It is littered with them: standing stones, circles and burial chambers, many in alignments and often very photogenic. The stones of Ballymeanoch were my favourites and I shot them using infrared film, something I’d never tried before. I went with Martin, the guitarist in The Rogues, who had also begun getting interested in photography. We got on well and had a great time, even if we did get wry, knowing, “they must be gay” looks from the other hotel guests at breakfast every morning. The project with Tracey had now developed into a full-blown obsession. Most weeks we’d spend a couple of hours in my kitchen as I painted her face in the style of a famous picture before photographing the result. We recreated paintings by Van Gogh, Degas and Matisse amongst others, with some vaguely emerging notion of getting twelve shots together to make into a calendar. Most of all however, it was the time spent together that was important, bouncing ideas back and forth, urging each other on to new creative heights. The year ended with The Rogues getting paid ridiculous amounts of money to provide the backing music for a variety of singers in a New Year’s Eve review show at The Brentwood Hotel in Rotherham. After The Holy Rollers finished, Grahame had done a lot of work as musical director for a few amateur operatic societies and he’d often used us to play in shows at The Civic Theatre or the Arts College, particularly for shows such as Grease or Bugsy Malone. He knew he could trust us to be able to play most styles of music so thought we’d be perfect for the gig. New Year’s Eve always pays well for a band but because it was the millennium, it was especially good. We didn’t actually have to work particularly hard either: play a few songs, have a break while the singers change costumes, play a few more songs, have another break and so on. In many of the breaks we went off to a quiet corner with our guitars and ran through possible new songs for the band. Quite naturally, a couple of Steve Earle songs found their way into our ever-expanding set list. It could have been the perception of circumstances, but for me, there didn’t seem to be any one really significant album this year. There were some brilliant, glittering songs by some great artists, but again, not a whole album that I played to death. Perhaps I just didn’t have the inclination to listen to whole albums or maybe the CD format ended the idea of two sides of a listenable length. I realise I could have just stopped playing the CD after four or five songs but that seemed wrong somehow. Or maybe other obsessions began taking over for a while. 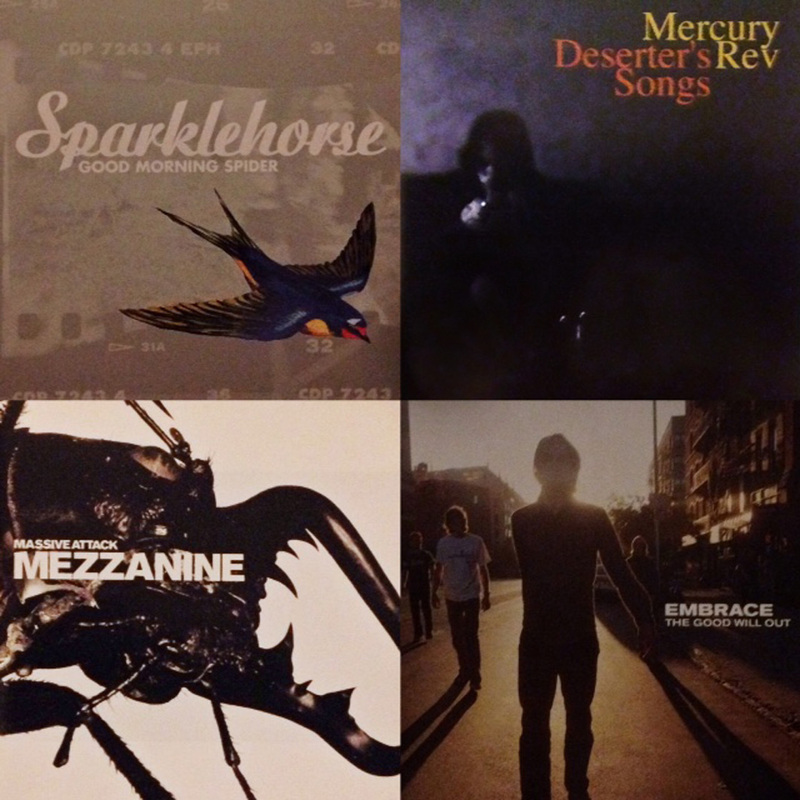 When they heard snippets of the “Deserter’s Songs” album by Mercury Rev, friends were very quick and almost delighted to point out that maybe, just maybe, I’d grown soft, laid-back and perhaps a bit more mainstream in my musical tastes. Ha! Obviously they didn’t realise that I was also listening to albums such as “Good Morning Spider” by Sparklehorse, with the megaphone-voice and fuzzed up guitar-squall of songs such as ‘Pig’ and ‘Cruel Sun’. True, “Deserter’s Songs” is, in places, a little more wistful and gentle than usual but with song titles such as ‘I Collect Coins’ and ‘Opus 40’, it certainly isn’t mainstream and very few, (if any) songs that I’ve heard on the radio, feature solos played on a bowed saw. ‘Holes’ does and is weirdly brilliant. I was really hopeful when I got the Embrace album, “The Good Will Out”. I loved the sparkle of the first track ‘All You Good Good People’ and the lushness of second track ‘My Weakness Is None Of Your Business’. The third song, ‘Come Back To What You Know’ begins in a slightly sombre mood but builds to a majestic, soaring chorus that quickly became one of my all-time favourites but then the rest of the album gradually got more and more disappointing and I rarely played it. We even put ‘Come Back To What You Know’ into The Rogues’ set list for a while. Our summer holiday was two weeks spent camping in France (well, in a static caravan) and I would sing the song to James, sitting on my shoulders as we traipsed around various market places. For some reason, every time I sang the first line, he would giggle happily. I also kept him amused (or probably bemused) by singing “Hark I hear the steeple bells, they’ll all be open now” every time a church bell rang. Only I knew it was from a Bonzo Dog Doo Dah Band tune, everyone else just thought I was bonkers, but it became our private joke. He and I played for hours, making cardboard food to put on the barbecue which he would ‘cook’, or making sandcastles on the beach while everyone relaxed. We went on holiday with friends: Gary, the other bloke, and myself got into the habit of trying to find the cheapest possible wine we could find. In the end, sixty cents got us a box of red which we could probably have used to clean the drains! The campsite was close to Croix-de-Vie where I’d stayed with the Amizet family in my teens and we’d arranged beforehand to visit them one day. It was lovely to see them again after so long and we chatted in their garden for hours. They were horrified to hear our exploits with wine, so Yves (the dad), gave us a very expensive bottle to prove, “just how good French wine can be.” The daughter Soizic, whom I’d last seen aged about six, was there with her husband, Jacques. He was a musician and, after talking for ages, he invited us to a gig that night with his band at a restaurant in town where I was invited to get up and sing. They couldn’t speak English at all but we played ‘Brown-Eyed Girl’, showing how music absolutely is a universal language. I did manage some time on my own, going very early in the morning to visit and photograph a couple of huge standing stones that were close by. The pictures were good – but I was becoming increasingly dissatisfied with landscapes. The images that really appealed to me in all the magazines I’d started reading were portraits, but I had no one I either wanted to, or who was willing to be photographed. In July I’d been on an art training course at YPO in Wakefield with Tracey, a new teacher who’d been at Roughwood for a couple of years but whom I’d not really spoken to much. We talked, laughed and played all day; an instant connection made. After the summer I made sure we were on playground duty together and we talked, laughed and played forever. After reading a book called Painting With Words, I hatched an idea to actually paint someone’s face to resemble, as closely as possible, the picture ‘Weeping Woman’ by Picasso and then photograph it. She was immediately up for it and later in the year we did it. A new obsession began. Tracey was also the only person I knew who’d heard the dark, pulsing rhythms of ‘Mezzanine’ by Massive Attack. It broods and threatens and contains the brilliant ‘Angel’ and ‘Teardrop’ but again, for me just gets a bit boring after a while. I needed something more: something that would come around the corner and hit me like a freight train. I did buy a few albums this year; the soporific but beautiful “Curtains” by Tindersticks, the eclectic “Bring There” by Wilco and “When The Boatman Calls” by the consistently brilliant Nick Cave, containing “Into My Arms”, surely one of the most moving songs ever written. In previous years all of these would have been played to death. However, they paled into insignificance when compared to the joy of watching James grow and discover the world, seeing things through new eyes, sensing his awe and wonder at so many experiences. By his first birthday, not only was he walking and running confidently, but would climb, jump and delight in tumbling head-over-heels at ‘Playworld’ play centre in Parkgate. He loved to make us laugh by kicking a ball and managing to kick himself in the face as he followed through with his leg. In the summer we went with about twelve other people (friends and friends of friends) to Florida in America. We had a few days beach time in Fort Myers but mostly stayed just outside Orlando to visit the theme parks. Our first hotel was truly awful and we quickly named it “Bates’ Motel”. We should have guessed what it would be like after seeing the tattered flags as we pulled into the car park. The chalet-style rooms were just as tattered and we had to roll a blanket up to give James some kind of mattress in the rickety old cot we were provided with. Every morning at breakfast (which we ate elsewhere – there was no way we were going to eat there!) we swapped stories of ants in the bathroom, TVs that would only get the Religious channel and huge, winged beasts (I may have exaggerated that for comedic effect) that threatened to smother a small child. We had to laugh to stop some of the party crying and we told ourselves it was only a base and we were out most of the day – but it was bad. One afternoon, we did return for a sleep and everyone agreed to meet at the hotel pool, only to find the lights in the water hanging from bare wires. We didn’t go for a swim. Regularly, the men would gather in the car park before setting off for the day, and have a kick about with a football. James, aged eighteen months, always joined in. In Disneyland and the other parks, he went on the majority of the rides but invariably fell asleep just as they started, seemingly unfazed by all the lights and sounds. There didn’t seem to be any lasting damage but he was absolutely terrified of the Winnie The Pooh character strolling around trying to be cute and make friends with the little ones. However, for some unknown reason, he loved Tigger. Who knows what went through his head and what went into his memory banks, but I don’t think it was that that made him scream his lungs out for what seemed to be the entire eight hour flight back home! ‘Magical’ is one of the ways to describe witnessing the birth of your first child, though nerve-wracking fits pretty well too. Having gone to work as usual on the morning of Friday 16th February, I received ‘the call’ at around 8.30am, “Come home now, it’s started!” I drove us up to Jessops Hospital in Sheffield and at six o’clock that evening, somewhat reluctantly and only after Mr Norman, the consultant, had tried all sorts – forceps, ventouse and good old encouragement, James came into this world. He needed a load of stuff cleaning out of his lungs and did need to be put in an incubator overnight, but he was here, right on time (to the day) and looking as beautiful as only a baby can. The delivery room had been packed with midwives, doctors and even a class of students who were keen to observe the birth, so it was quite a dramatic change, after everything had been checked (he had ‘a roof to his mouth and a hole in his bum’; my mum’s definition of a healthy baby) to find ourselves alone in a room with a tiny person who needed dealing with! After ringing friends and family with the good news (and after having been propositioned by a prostitute on my way back to the car!) I drove home later that night and slept more soundly than I had for weeks. It wasn’t until the next day that we found out how at six o’clock the previous evening, exactly as James was being born, there’d been a ‘Mother Of Pearl’ sky over Sheffield (Nacreous clouds apparently), a pretty rare phenomenon this far south, with lots of beautiful and strange colours. We maintained that it meant he was destined to be special, but our Neil said, “Check behind his ears,” suggesting that, along with the three sixes in his time and date of birth, it was an omen and he could well be a ‘devil-child’! When James was first put onto Wendy’s chest, he’d pushed himself up with his arms and appeared to be looking around the room, the midwife declaring, “He’s not supposed to be able to do that!” Not a devil-child, but certainly not average. Within days, it was difficult to ever imagine there’d been a time without him and I quickly adapted to functioning in a state of constant exhaustion. When you hear stories of parents murdering their children, you obviously can’t condone it, but there are times, times when the screaming seems to go on for ever, that you can certainly understand it! 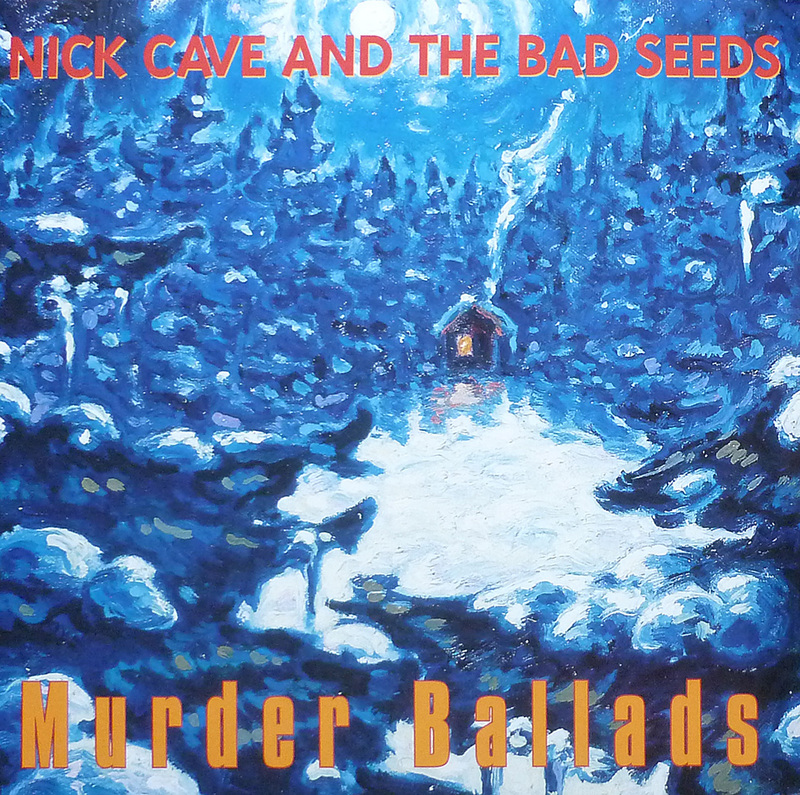 “Murder Ballads” by Nick Cave and The Bad Seeds contains some of the darkest, most disturbing lyrics ever written, set to some of the most beautiful melodies. “Henry Lee” and “Where The Wild Roses Grow” are the two most obvious songs where Cave’s murderous vocals juxtapose with the smooth melancholy of P.J. Harvey and Kylie Minogue respectively. Elsewhere, the album goes from the cabaret-style music and almost comic-book violence of “The Curse Of Millhaven” where the protagonist, after countless murders, exclaims, “They ask me if I feel remorse and I answer, ‘Why of course! There is so much more I could have done if they’d let me!” to “The Kindness Of Strangers” on which the woman’s sobbing is so mournful it almost breaks your heart. “Murder Ballads” is darkly humorous with a sombre, literary and passionate heart; perhaps the perfect soundtrack to accompany the few months when my son was joyfully taking his place in this world as my father-in-law was leaving it. He died in August. After a week in Cornwall which followed the funeral, The Rogues, who’d never stopped playing (I was always tired anyway so I figured I may as well) got together for a couple of days at ‘Sight And Sound’ studios in Bolton on Dearne to record our second tape. We did most of it live on the first day, with just a few overdubs, then mixed it on the second. It was engineered by a bloke called Andy Seward, who’d apparently worked with various people at the BBC and in the folk world and who we thought could pass on useful tips and maybe put our name about a bit. He did tell us not to smoke ‘skunk’ because, “It does your head in!” but as far as I can remember, that was it. Good bloke though and the songs sounded better than on our first cassette. As usual, I was left to sort out the artwork and found the perfect picture in what was often my first port-of-call when looking for inspiration: the book ‘Entertainment’ by David Kennedy. It was an illustration from 1848 by George Cruikshank called ‘The Drunkard’s Children’ and seemed to capture perfectly the spirit of our audiences at the time. I called the cassette ‘For The Drunkard’s Children’ and delighted in the fact that I’d been able to get a classic piece of artwork into the consciousness of people who ordinarily wouldn’t have looked twice at it. We sold a few hundred copies and, had we been able to afford it, could have made and sold many more. I would often come home late after a gig, have a quick shower to try and get rid of the smell of cigarette smoke and end up sitting in the darkness with James in my arms, giving him his bottle and reciting sections from Longfellow’s ‘Hiawatha’, which we were doing at school and which I’d managed to learn off by heart. He never slept a whole night through until November, when he learned to walk. On that first day of walking, he slept the whole night, as indeed, did I. At last. No more murderous thoughts. “The ancient stones watch silently in the still light of the early morning; this is one of the best times to visit Avebury and absorb the magic wisdom of this temple, so very different from the grim gloom of Stonehenge.” These were words from “Mysterious Britain” by Janet & Colin Bord that I’d poured over since buying the book years before. I’d grown up being regularly taken to see air shows, zoos and sites of geological or archaeological interest so it was inevitable that I’d pick up on some of those things later in life. An interest in stone circles and burial mounds had resurfaced whilst at college after lengthy discussions with a girl called Angela and more recently with the albums “Peggy Suicide” and “Jehovah Kill” by Julian Cope. His latest, “20 Mothers” continued in a similar vein, including songs called “Stone Circles ‘n’ You” and “By The Light of The Silbury Moon”. Having grown up in a house where the kitchen regularly smelled of photographic chemicals and with both a mum and dad who always had a camera with them, it was perhaps also inevitable that I should become interested in photography at some stage. It was only a matter of time before the stones and the photography collided. The words from the book kept coming back to me, Avebury at dawn it had to be. I borrowed my dad’s camera, a Canon EOS 650, and loaded it up with Kodachrome 64; I’d read that that was the best film to use for landscapes. I planned my route, got my gear and set off at two o’clock in the morning, having estimated it’d take me about three hours. It’s always quite exciting to be out and about when everyone else is still in bed but once it started getting light, I realised I’d have to get a move on if I wanted to see the stones at dawn. Soon, I was racing the sun as it started breaking through the early morning mist. I sped past the impressive Silbury Hill (vowing to come back there later) and went past the official car park to get into the village where I’d read the stones were and then…whoa! Two huge monoliths reared up in front of me. I screeched to a halt in the car park at the side of the cricket club hut, grabbed my camera stuff and scrambled over the barbed wire fence and up the steep bank of the henge. In front of me was a more astonishing sight than I could ever have imagined and I stood taking it all in. I was the only person there. It was mine. For the next couple of hours I rushed around breathlessly setting my camera up at various places; in the stone circle, on the Avenue, at the Cove, everywhere. I laid down, knelt and crouched, trying every possible angle. At one point, the mist rolled in making the sun appear as a mysterious, hazy disc low in the sky but then it burned through and the rays shone gloriously onto the craggy, ancient stones. In the whole time I was there, I only encountered one lady walking her dog. Eventually, I ran out of film and even though I was sure I’d got the shots I wanted, nothing could ever convey the truly magical experience of that first visit to Avebury. There is only so much “Diddley Diddley” music you can stand. The Rogues have never really been a true Irish band, a folk band or a Country-Rock band, having always maintained that we are a punk band in the true spirit of the word; we don’t care what we play or how we play it, if it’s a good song, we’ll do it, whatever the genre and whoever the audience is. Irish diddley stuff at a bike rally? Rock music at a wedding? Yep, we’ll do it. However, I was spending a lot of time playing banjo or mandolin-led music and it was perhaps in response to this that I bought Neil Young’s latest album. 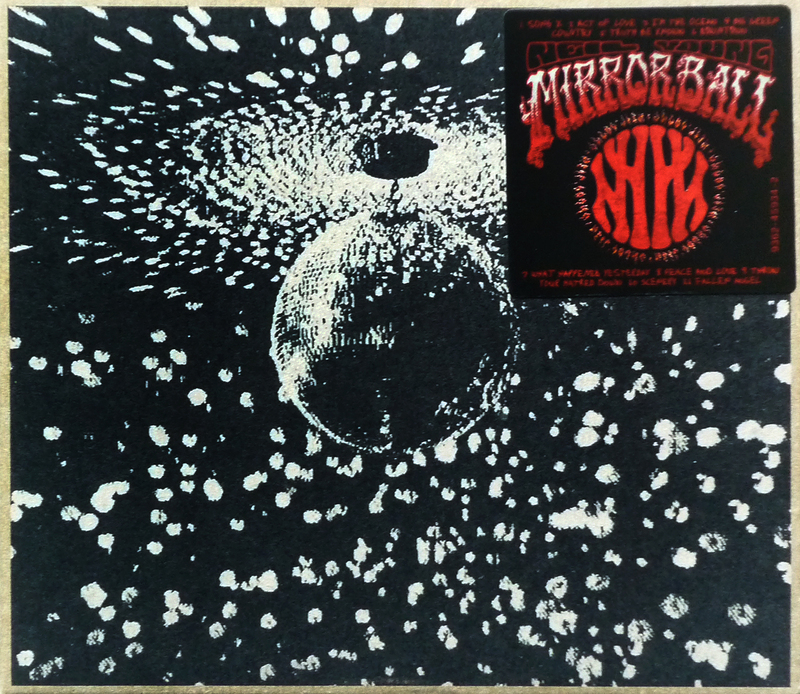 Now, he’s never been a laugh-a-minute kind of bloke noted for his lighthearted approach to song writing, but “Mirrorball” is a particularly weighty record full of heavy riffs and intense themes. Using Pearl Jam as the backing band, it has some great tunes on it and features Young’s distinctive, chiming guitar sound, but it’s not what you’d want to listen to on a Summer’s day driving through the countryside. It opens with “Song X” a dense, grungy sea shanty that sets the tone for the duration. On “I’m The Ocean” Young declares that, ‘people my age, they don’t do the things I do’ which is exactly what makes him such an exciting, curmudgeonly old sod who never does what people expect him to do. And which is why The Rogues have never really fitted into any musical pigeonhole. 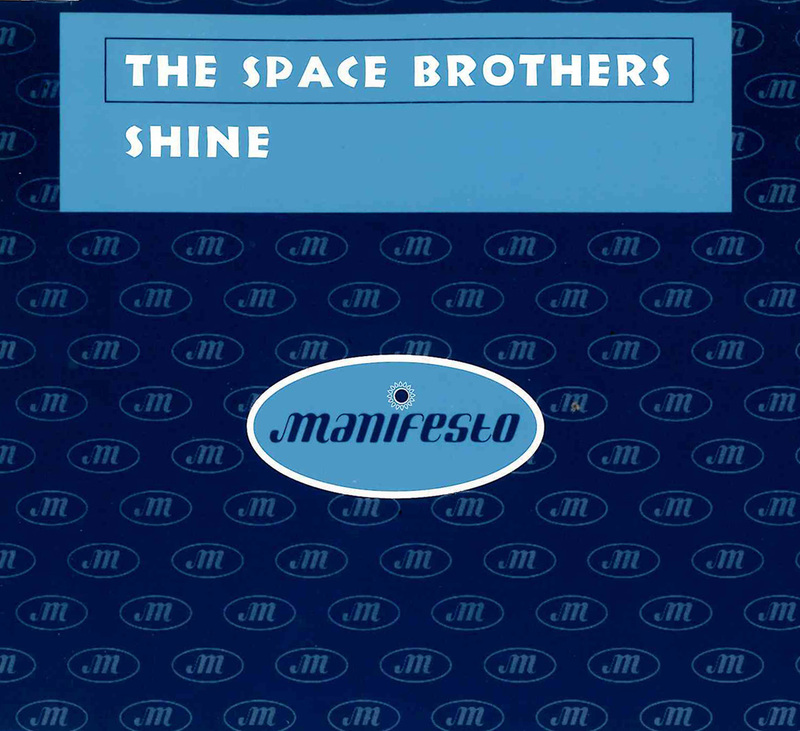 Where we differ in attitude is that on “Mirrorball” none of the proper songs are under four minutes long and many are a good deal longer, whereas we’ve always tried to get them over and done with in under two minutes. That’s what you get for having seen the Ramones I guess. I decided that seeing as how I’d been singing about Ireland every week for a couple of years, it was time to go and experience the real thing. Which was why, in the summer, a fairly newly pregnant (phew) Wendy and I flew on a Fokker 50 (the pilot separated from the passengers by a drawn curtain) and hired a car to travel around Southern Ireland to visit as many places in the songs as possible. We picked the car up in Dublin (home of Molly Malone) driving through Mullingar (“Rocky Road To Dublin”) to stay in Galway (“Galway Races” etc) for two nights. There, we went to a few pubs, one where we saw a few blokes, surrounded by Spanish tourists, playing traditional music but looking totally bored and really just going through the motions. In the hotel bar that night we watched a Country & Western band. Next day we went out to the Connemara National Park (“Hills Of Connemara”) which was truly beautiful. From there we took a very circuitous route through Athenry (the fields were particularly low-lying) onto Limerick (where there was an old lady) to Tipperary (it was a long way) before ending up in Cork (near the ‘sweet Cobh’ mentioned in “The Irish Rover”) for the night. We saw a band in the hotel bar – playing Country & Western. After a couple of nights there, we passed through Waterford, up to see “The Curragh Of Kildare” (a racecourse) called in to the Newgrange monuments on the River Boyne before going back into Dublin for a couple of nights. On one of the nights we’d been invited to a wedding by Louise and Carl, two regular Rogues fans. We knew nobody apart from the couple but were absolutely welcomed with open arms by everyone there, all asking me to sing them a few songs. I declined. It didn’t feel right that a lad from Sheffield should sing Irish songs to a load of Irish people living in Ireland. Next day, on an early morning stroll around Dublin, we stumbled across a film crew shooting scenes for a forthcoming film about Michael Collins starring Liam Neeson. At least I now knew what I was singing about but as for the music? Well, there’s only so much Country & Western you can stand! Playing rowdy Irish music at a time when ‘laddish’ culture suddenly blossomed? We couldn’t go wrong. The residency at The Station was steadily building a pretty solid fan-base; people coming one week then bringing their friends along the following week. We met Keith and Vi who were nearly always there, along with two women whose names we never did find out. We had regular gigs at The George And Dragon in Wentworth that were always frantic and fabulous, including a St. Patrick’s Day which was absolutely packed to the rafters with people dancing on tables, breaking chairs and using the legs to bang on the floor or the window sills and literally drinking the bar dry! They really did run out of beer that night. We had gigs at The Charter Arms in town that, as with The George, were boozy, sweaty and brilliant. At one outdoor gig I was complimented on my “percussive and original” style of banjo playing by an old “folkie”. I didn’t have the heart to tell him it was simply because I couldn’t play the traditional finger-picking way and had had to take off the fifth G string because it kept getting in the way. All the best bands hold out their hands and scoop all their influences up, before smashing their hands together, mashing things around a bit and then seeing what comes oozing out between their fingers. Then, either by design or, more frequently, by inability, try to play the ideas and come up with something new and exciting. That is exactly what Oasis did with the sneer of The Pistols, the Manc drawl of Happy Mondays and the bright, crunching guitars of 70s Glam Rock. Kicking off straight away with their declaration of intent in “Rock ‘n’ Roll Star”, it leads into the Coke advert rip-off of “Shakermaker” with talk of building houses out of plasticine and later, the T.Rex riff on “Cigarettes & Alcohol”. 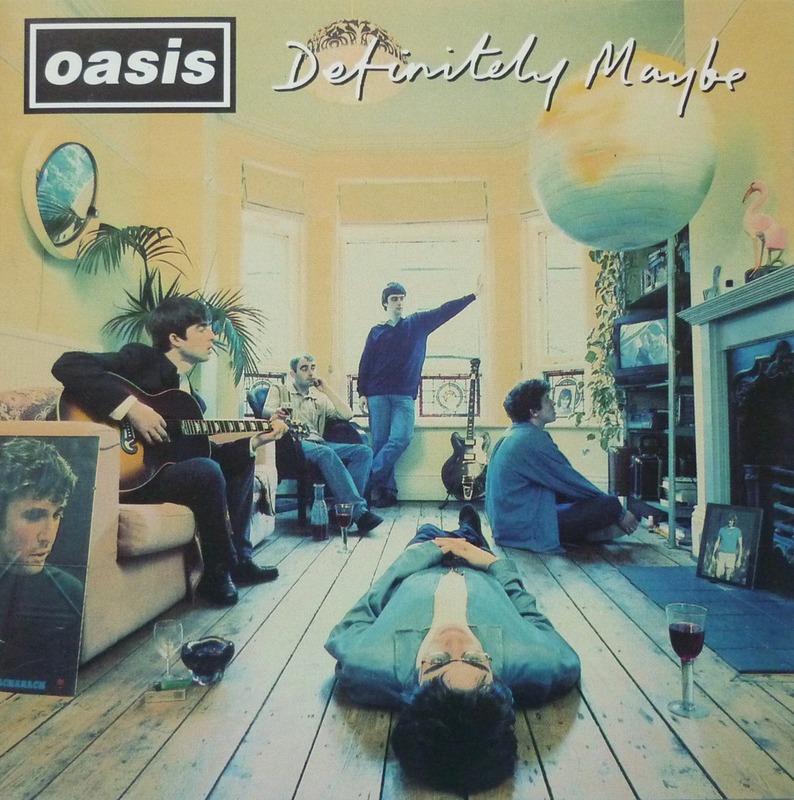 “Live Forever” is, for me, possibly their best song with its call-to-arms for anyone who’s ever felt they, “see things they’ll never see.” Whilst the album helped redefine “lad culture” started mainly by other Manchester bands, I never bought into it and knew it was all part of the image game, sibling rivalry and petty punch-ups. I knew because everyone thought The Rogues were drunken lads banging out chaotic Irish Stomp instead of a bunch of talented musicians with a singer who could remember song words and shout a bit. But then, when your audience finish the night in a drunken stupor and try to be your best mate, they assume you’re as drunk as they are! Perhaps because I’d hardly bought any new music the previous year, I was back on track collecting again. Oasis were pure rock and roll but I listened to a huge variety of other stuff with albums including “Dummy” by Portishead (fairly dark and sombre) “Snivilisation” by Orbital (electronic trance-dance) “Sleeps With Angels” by Neil Young (dirty country-rock) Pulp’s “His ‘N’ Hers” (Sheffield through and through) and “The Snake” by Shane MacGowan and The Popes, an album full of Irish trash from which I took a couple of songs to do with the Rogues. Part of my Saturday routine was to go to Contour Gym for a couple of hours, have a protein shake then go down to Circles Record Store on Wellgate in town and flick through the new seven and twelve inch singles, looking for coloured vinyl or picture discs. I’d always been told that the sound wasn’t as good as the standard, black vinyl but I didn’t care, it’s the look that’s just as important. The vastly differing styles of music reflected the ups and downs I went through this year. After losing our first baby through miscarriage at around twelve weeks the year before, Wendy became pregnant again. Things seemed to be fine until the scan at around twenty weeks when the nurse told us to be prepared, it was twins! We were gobsmacked but absolutely elated. The rest of the day was spent in a blur telling parents and close friends, in the meantime being told it shouldn’t really be a surprise as twins were quite common in my extended family. It was the next morning when we had a call from Jessops Hospital asking us to go back to see them that we began to get a little nervous, but never once expecting what came next. They took us to another, more detailed scanner to show us and break the news that the twins were in fact conjoined. Some high-up consultant came to explain what could be done; they could be born, hopefully naturally, and then at some time in the future, undergo an operation to separate them which may or may not work. He explained that the rarity of the situation (one in every two million or something) would mean news coverage. Coverage that would involve reporters camping outside our house and the consultant performing the operation, of course becoming famous. I somehow remained remarkably clear-headed and asked many questions about such things as likely quality of life for the twins and what exactly would the operation involve and what might the consequences be. The decision in the end was easy – no chance. We were not prepared to subject two little ones to all that, simply to satisfy the desire of some avaricious consultant doctor wanting to experiment with ground-breaking surgery. Within a few days it was all over; the twins (girls) were delivered, photographs were taken but we didn’t want to see. It was undoubtedly the best and worst few days of my life so far. Did the music help? Maybe? Definitely.